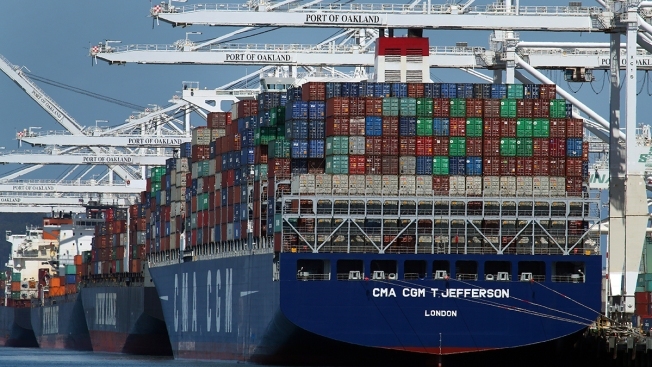 In this May 21, 2018, file photo, container ships are unloaded at the Port of Oakland in Oakland, Calif. On Wednesday, May 30, the Commerce Department issued the second of three estimates of how the U.S. economy performed in the January-March quarter. The U.S. economy grew at a weaker 2.2 percent annual rate in the first three months of the year, as consumers and businesses slowed their spending. But given the economy's recent performance, analysts are still looking for a solid rebound in the current quarter. Growth in the gross domestic product, the economy's total output of goods and services, came in slightly below the first estimate last month of 2.3 percent in the January-March period, the Commerce Department reported Wednesday. GDP is expected to strengthen to a growth rate of about 3 percent in the April-June quarter. The new report was the government's second of three looks at GDP in the first quarter. The biggest factor in the downward revision was less inventory building by businesses, which shaved 0.3 percentage points off growth. Paul Ashworth, chief U.S. economist at Capital Economics, said the downward revision in inventory growth was a good sign for the future because it means businesses will have more room to build inventories in coming quarters, thus adding to GDP. "The incoming monthly data suggest that second-quarter GDP growth will be much stronger," he said, predicting a rebound to growth of 3 percent to 3.5 percent in the current quarter. President Donald Trump said in a tweet Monday that the country was enjoying the "best economy in decades." The president contends that his program of $1.5 trillion in tax cuts, government deregulation and tougher enforcement of trade laws will lift the economy to permanent growth rates of 3 percent or better. Sung Won Sohn, an economics professor at California State University, Channel Islands, and other economists believe the chances of an outright recession starting in 2020 have risen, saying that some of the growth the country will enjoy over the next two years will come at the expense of activity in 2020. "I think there will be a significant slowing in 2020 and I wouldn't rule out the possibility of negative GDP that year," Sohn said.